Our Reflective Small Dog Vest is designed for the small working dog. It is made with weather resistant 1000 denier nylon/urethane coated fabric and lined with quilted fabric for comfort. The seams of this vest are bound in reflective webbing as an added safety feature for your dog. The front chest and the girth straps are adjustable. The front chest strap is made of elastic material. There is a D-ring for attaching a leash. 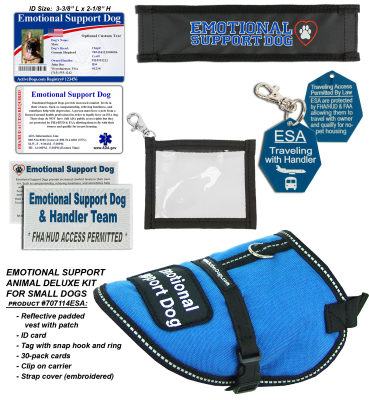 Emotional Support tag states on one side that this is an ESA traveling with a handler and the other side is the FHA/HUD & FAA protection information. Includes a trigger snap clip. The Embroidered Identification Strap Covers give you high visibility with getting your message out to those you meet. We have embroidered a colorful very high stitch count identification message on a dark background colored fabric. The dark background is a UV fade resistant fabric and will give you many years of service. Both sides of the strap cover are embroidered with the same message so if your leash is twisted you will still be able to send your message to the public. Each end of the strap cover has a hook & loop closure. To use, open the hook and loop ends, slip your leash/strap through the cover and press the ends closed. This Identification Strap Cover will fit on a leash, collar, or any open ended strap. The Clip-On ID Carrier is a must have for your dog's identification card. Simply clip onto any dogs collar, vest, or handlers clothing for quick access to your dog's important information. This Clip-On ID Carrier is made out of heavy gauge vinyl for maximum durability. Clear vinyl on both sides and bound on all sides. Size is 4" x 5" and features a heavy duty hook and loop closure. Each card contains access information and federal contact information. They are color printed on both sides using heavy card stock paper. They are not laminated. These cards are perfect for helping others understand your rights as a handler of an emotional support dog. Cards come in a zip-lock, reusable bag.